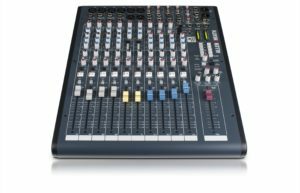 I highly recommend this mixer for LP-FM, Internet, and Small Broadcast stations. First, this board has first class quality. It will give you many years of excellent, trouble free service. I mainly like the (2) Telco (Mix-Minus) inputs. I use my Telco inputs for our Comrex Stac VIP telephone system and the Comrex Bric Link ll. This board provides for ON AIR Light switching, Speaker Muting and Remote starting devices. Yes, USB bi-directional connectivity. I almost forgot the (4) Balanced or RCA Stereo mixing positions. I love this board, I have at least 6 currently. Click here to get a closer look from Sweetwater. Click on the picture BELOW to purchase this board from Amazon for under $1,200.00. If you purchase this board from Amazon by clicking on the picture BELOW we will assist you in installing it over the phone. Click on this picture to purchase this board for under $1,200.00. We will assist you in the installation over the phone.